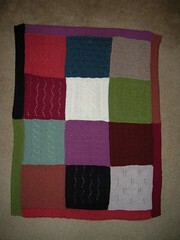 I'm back to work after a short leave ... one filled with knitting & crocheting Christmas gifts. But I did complete something for myself. 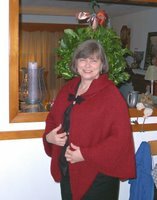 Here it is ... the cape with me wearing it on Thanksgiving Day. 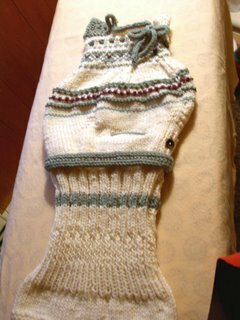 The yarn I used is Winter Berry Decadence from KnitPicks. The softest and warmest yarn I've every used. I absolutely love it! 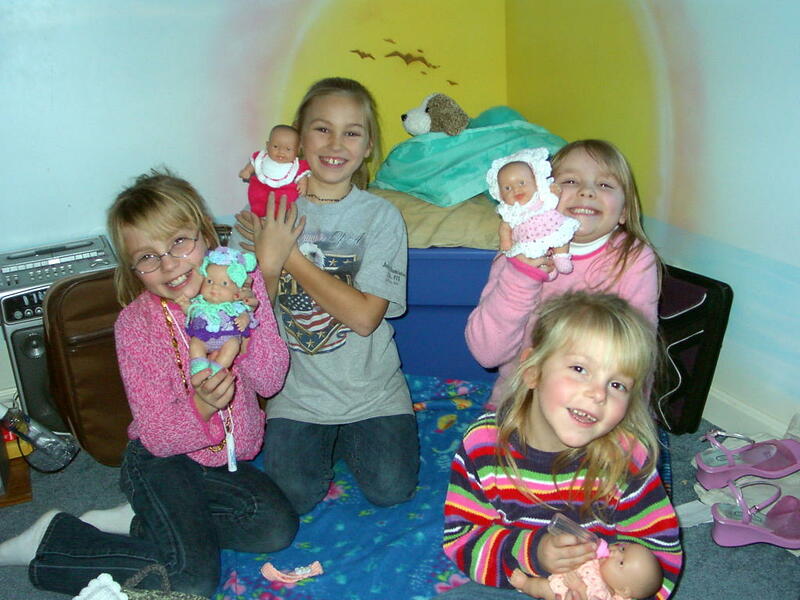 the Dolls for my grand daughters. Now I MUST say, those dolls were a "big hit". I had to find the girls in the back bedroom inorder to get this picture. Their excitement was just sooooo SWEET! 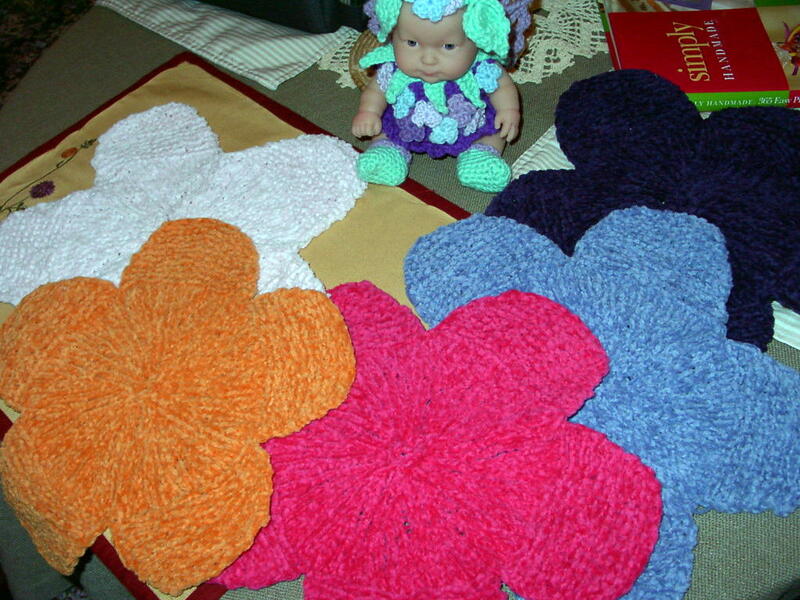 Now if that isn't enough ... here are the flower washcloths I made this summer with the last of the dolls I made. 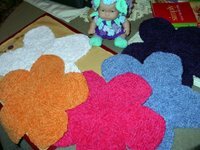 They're officially called "Reverse-Bloom Flower Washcloths" and are from the Weekend Knitting book edited by Melanie Falick. 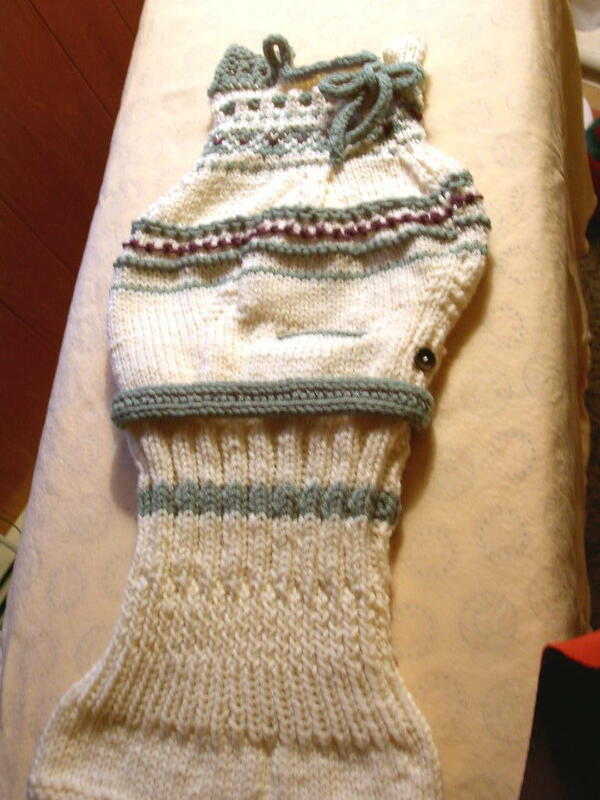 The pattern also can be found in the Winter 2003 Interweave Knits. The washcloths are knit up using one skein of Crystal Palace Cotton Chenille on #6 (4mm) needles. 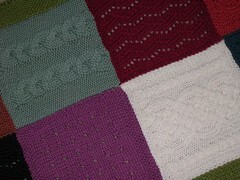 And now I'm knitting myself a bath rug from The Knitted Rug : 21 Fantastic Designs by Donna Druchunas. Using up left over yarn, you know. In fact, I'm using up all that ucky acrylic (well it has it's uses) yarn. 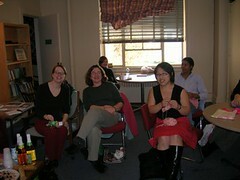 Happy knitting girls. I'll see you this Thursday. No, I'm not referring to Alexis Stewart. You'll need to go speak with The FemiKnit Mafia about that one. We all contributed a square to the project. Here's a "flat" shot of the finished product. 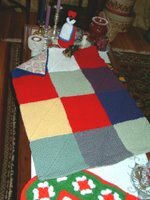 From left to right, top to bottom, the squares were made by Danielle, Christine, Cynthia, Erin, Deborah, Rhonda, Kathy, Paula, Claudia, Katie, Chris Q, and Jess. Danielle and The Mafia worked the border. Yarn: Mission Falls 1824 Wool; 100% superwash wool. We used 12 different colors. I'm not even going to try to name them. Gauge: One might think that the gauge was 18 sts and 24 rows in a 4"x4" swatch, as the name implies. If one thought that, one would be very wrong! I think our gauges ranged from 16-21 sts/4 in. Our "8 inch x 8 inch" squares were anywhere from 7.25 to 8.75 inches wide. Some aggressive blocking techniques were used before seaming up this bad boy. Needle size: I used a 9. The Mafia used a 6. I'm guessing the rest of us were somewhere in between. Pattern: We all chose our own stitch patterns. 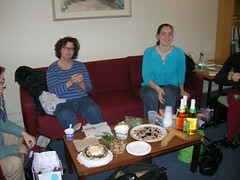 Except for Paula, who had to knit up her second choice stitch pattern, since Rhonda "took" her first choice. Edging is just a simple garter stitch with a slipped stitch selvage edge. 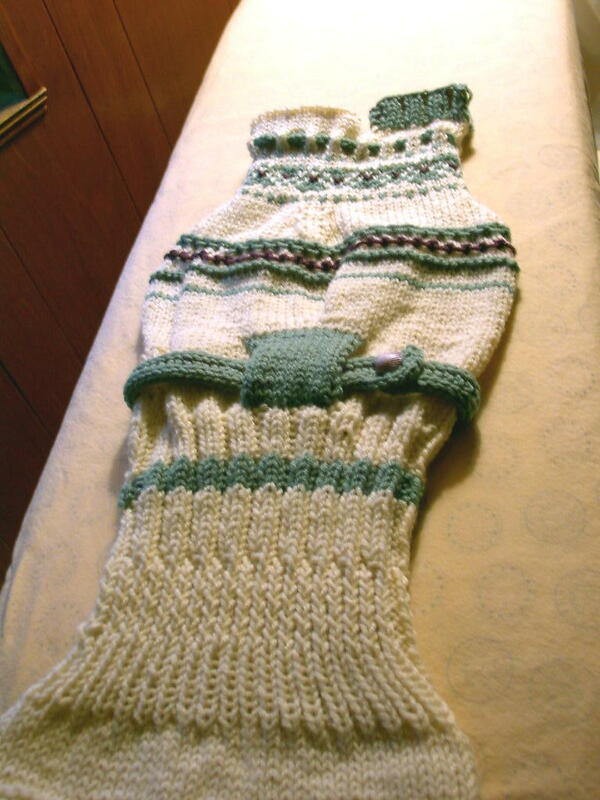 Baby K, we hope that you will enjoy snuggling up in your blanket during your first New England winter! Okay... so what is it? 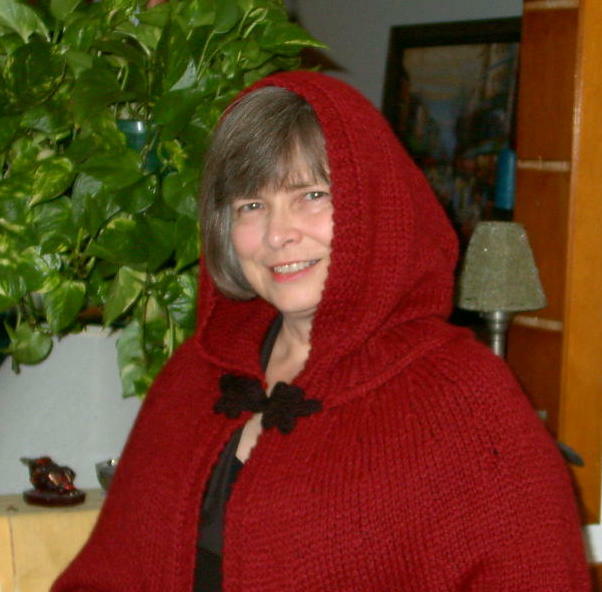 Comes from Creative Knitting Magazine November 2005 issue It's the red cape -- but it isn't red. I did mine in KnitPick's Decadence in Winter Berry. It's superfine alpaca and just the most lovely yarn against the skin -- light yet warm. I'm wearing it with black ... just haven't decided exactly what that'll be yet. I did learn something new for my knitting skills ... called "three needle bind-off." Here's a visual site to see how it's done, in case you're a "visual kind" of learner and have never done this before like myself. Worked great! Originally uploaded by stacy's plate. 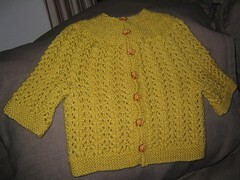 I finally finished the cardigan for my baby! I don't know how old he'll be when he fits into it, but at least it's lace and will breathe in case it's spring or summer. My luck it'll be August before he fits into it and he won't ever get to wear it! There are a couple of flaws in the final product but I won't list them here. Click on the image and you should see a detail of the lace pattern and the wood turtle buttons. A crafty friend of mine and her pal were accepted into this year's Bazaar Bizarre! I've never been, but it sounds like a lot of fun and a good way to support local "alternative" crafters and get some holiday shopping done. Unfortunately, I doubt I'll be able to attend as it's 4 days before my due date. You can see some of my friend's work here. 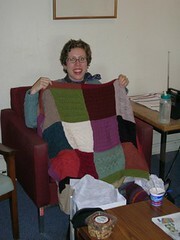 She knits, but there's no knitting on the site at this time. Rollie, the greyhound is a lovely model though, dontcha think?